Artisan Crafted Lighting offers a vast range of hand-crafted, fine art lighting, as well as thorough custom lighting design services. Our knowledgeable staff and talented artists have completed dozens of custom projects to our clients’ specifications and satisfaction. Whether you want to customize an existing fixture in our online catalog, have a vision you just can’t seem to find on the market, or you want to combine concepts from a number of different fixtures, we are here to help! Most of Artisan Crafted Lighting’s catalog features customizable lighting fixtures: wall sconces, outdoor lighting, lamps, pendant lights, chandeliers, and ceiling lights—depending on the product, customize your size, color, hardware, and/or fixture configuration. Below you’ll find a selection of our favorite custom projects. If you are a home or business owner, interior designer, or an architect looking for a one-of-a-kind, custom lighting fixture, call us! Artisan Crafted Lighting creates custom replacement pieces for existing lighting fixtures our clients want to spruce up or repair. Left: A leaf of an Italian Chandelier we are recreated as replacement for some pieces that had broken over the years as the customer relocated. 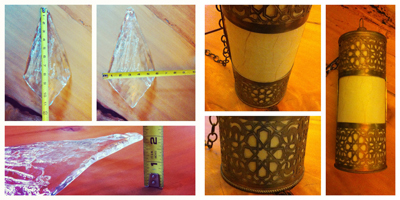 Right: A Moroccan-style pendant light in which we are replacing the (plastic) diffuser with iridescent, opaline glass. 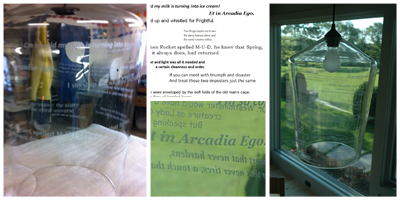 The customer and his wife wanted a unique pendant light for their vacation home that had all their favorite book quotes etched into the glass. The customer provided us with the vector file that had all the quotes in the desired arrangement, size, and typeface. 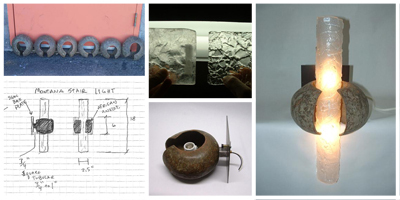 The client provided us with images of six rare African anklets that were to become wall sconces. We received drawings of how the client envisioned the anklets incorporated into the design. We connected with one of our artists who rendered a schematic for client approval. 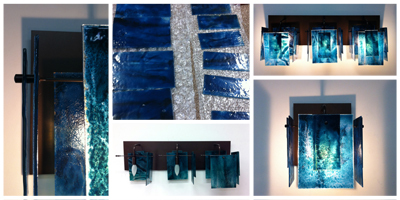 Our artist provided glass samples as options for the diffuser portion of the wall sconce. After approval, our artist went into production and sent us progress photos along the way. The completed product was shipped to the client! 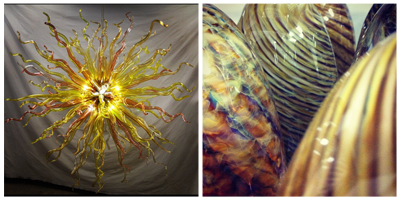 Artisan Crafted Lighting is proud to work with Robert Kuster on many different art glass lighting projects. 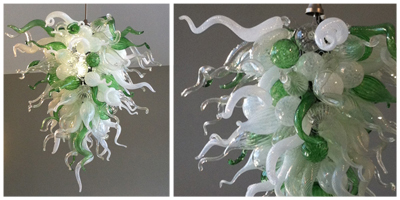 His glass work and glass chandeliers are inspired by organic forms in nature; above is a chandelier we commissioned by Robert Kuster for Schiffman Grow & Co. in Worthington, OH. We used a custom color combination to match the company colors. All Kuster designs are diverse; colors, shapes, and sizes are customizable to any project. The Twilight Island wall sconces are a modern, eclectic mix of sleek oil-rubbed bronze hardware and stunning aqua blue glass. The glass shingles are drilled with holes at varying distances from the top edge, to create movement within the geometry of the fixtures. This project was born from the client’s desire to have the Spider Glass Sconce in aqua glass: an option that is unavailable on the market. We re-created the hardware and had the glass pieces custom-made. Voilà! We are now able to offer this sconce as a member of our online catalog.